When it comes to email marketing, the idea is simple: create content that inspires your readers to do something. 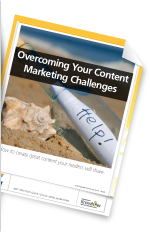 But for many business owners, developing creative or inspiring content can be a challenge. My best advice is to block out time one or two days per week to brainstorm ideas. Also, always have a piece of paper ready when an idea strikes you — some of my best ideas come at times when I least expect them. Be sure you are able to capture topics your audience will find interesting. Try to list several topics at a time so you aren’t trying to develop your content when your newsletter deadline is looming. Be sure to provide value to your readers – don’t make your newsletter all about your new products. Show your expertise and share information. If you provide valuable content, the reader will remember and will possibly become a customer. You can offer a special or a product highlight but also offer a helpful tip or advice. If you are completely overwhelmed with the idea of creating content, consider hiring a writer or someone who can help you transform your ideas into articles that inspire action. I believe that outsourcing help can definitely be worth the investment if it is how your message will get out. Constant Contact has created a useful guide that will help guide you through the process of creating content and how to get through some of the hurdles. The most important task is to just get started. Once you get your first newsletter out, you will find the following one’s just get easier. E-mail marketing is a powerful tool if used correctly. You need to respect your contacts and not only provide them with information about your business, but also add value and interest. Remember, you are using e-mail marketing to enhance your relationship with your customer. Tell your story, why did you start your business? Explain to them why you are different and share details on who you have helped and how. Include videos that feature current clients talking about how you solved their business issues. Most importantly, be authentic. This applies to your Social Media postings as well. Don’t always push your product and services – demonstrate your value. Post articles that show you are leader in your industry by providing them with solutions and tips. When sending newsletters and e-mails you need to be mindful of the frequency. Sending too many e-mails can annoy your audience. Be sure to check the reports in your e-mail program to gauge your engagement. Are your customers opening your e-mails? Are they unsubscribing? Some of these trends will indicate whether or not you are providing value and if you are sending too frequently. If your list is large, you may want to try A/B testing. Divide your list into two groups and send two different types of e-mails and see which one gets the most engagement. Another idea is to survey your customers to ask them what information they would like to receive from you. One of the biggest obstacles small businesses face is how to grow and keep their lists. First it all goes back to the first point of providing value. If you distribute useful information your customers can use, they will continue to read your message. If you continually only focus on your business offerings and try to sell them in each e-mail, you will lose readers. Here is a useful resource from Constant Contact that outlines 10 important steps to keeping engagement with your list subscribers. The most important point when building and growing your list is to have permission to e-mail. Do not send e-mails to leads or potential customers who have not given you permission to add them to your list. Many small business owners are reluctant to work with Yelp but Yelp is here to stay. It was recently announced that Yahoo! will be partnering with Yelp to enhance their local search functionality. I personally know many people who turn to Yelp for information on services and businesses before they hire them – not as the solitary source but definitely as part of their research. I encourage all my clients to claim their Yelp page, add their business information and photos and monitor the reviews. If they receive a bad review, respond to it professionally. I do hear that many business owners feel the Yelp reviews can be unfair or biased to businesses that pay for advertising and some businesses are finding that reviews are not showing up on their pages. Yelp has been working to combat many of the issues brought up by small business owners. Their Communications Director, Vince Sollitto, was recently interviewed on Ronn Owens on KGO Radio. You can listen to the podcast here. I felt this was an informative and candid interview where he explained Yelp’s business process and how/why certain reviews are posted when others are not. There were a mix of callers – some who relied on Yelp to grow their business and others who felt Yelp was unfair with their reviews and ratings. I do think if you are a local business and rely on your local community for business, Yelp is a necessary part of your marketing and it should not be ignored. The social media and on line marketing landscape is always changing and evolving. I find sites like Social Media Examiner and the Constant Contact Blog help me stay up to date on the latest changes and current trends. My clients often ask, how do I rank high on Google and other search engines? This is an important question but you need to decide what kind of visibility you are looking for. If you are a small business, you need to ask how much you are willing to pay to be a top ranked listing on Google and other search engines. It is not just keywords now. There are many factors that play into where you are listed – relevance, cross linking from other sites, current content and more. The Google algorithms are changed frequently. There are many companies that specialize in SEO and will get you placed higher but if you are a local business, your time and money may be better spent focusing on the local search. Make sure your business is listed on sites such as Google Places, Yahoo! Local (there are free and paid choices), and Yelp. Ask your current customers to submit reviews on these sites to help your ranking in your local area. If you get a negative review, address it on the site and contact the customer to try to resolve the problem. It is also important for small businesses to claim their names on the different social media platforms. Even if you are not going to use Facebook or Twitter, you want to be sure you have claimed your business name before someone else does. And who knows, you may decide to start using these platforms in the future. Social media is an important tool to help you stay top of mind with your customers. You do not need to be on every platform – pick the one that is most suited to your business. Are you an interior designer? Then a pinterest page for your business would be a great asset. Local restaurant? Be sure to have a Facebook page where you can showcase menu items and specials. If you are using Constant Contact, you may want to consider using Social Campaigns to increase your e-mail list and Facebook exposure. There are many ways to increase your exposure as a local business without investing a lot of resources strictly to SEO. Use the local tools and get the conversation started on social media by engaging your current customer base. do you know what social networks your kids are using? As a parent of teenagers, I continually try to keep track of the websites and social media sites that are popular with kids. Facebook is no longer a platform they use to communicate with their friends – instead this is where their parents are active. I ran across this comprehensive article from NBC News highlighting some of the new sites kids are using that most parents are unaware of. Many of these sites were discussed at a parent education class at our middle school and high school presented by McAfee. During the presentation, I was surprised how many parents A. felt it was crucial to track everything their kids were doing on line and B. had no idea how or where to look. I strongly believe you need to know where your kids are posting but there also needs to be a level of trust and communication about on line activity. If you are not asking them what they are doing, they are not going to tell you. Teenagers need to understand what they post and send by text lives in cyberspace forever. Their activity can affect future college acceptances and job offers. Colleges and companies routinely check the digital identity of applicants and some deny positions depending on what they find. You can no longer easily monitor what your kids are doing by checking the family computer – there are too many ways to get on line now so it is critical your children understand the consequences of the choices they are making when posting personal information on line. You may think you are checking their texts by accessing their phone, but are you checking their Viber or Kik account? What about SnapChat where they can delete pictures after a few seconds. What they don’t understand is that picture is still on a server (or several servers) somewhere and there is an app that saves the pictures without the sender knowing. Here is a great video our high school librarian shared demonstrating choices and consequences when texting. I want parents to educate themselves but I also want them to talk to their kids. I felt so many parents were just plain scared and their answer to the problem was to figure out how to track everything. I don’t believe that is the answer. Checking your kid’s phone is important but it also can be a violation of trust if you are not up front with them. I think families need to work together to find a middle ground. For more resources, visit the McAfee Online Safety for Kids website. Here you will find a multitude of resources and tips to monitor and discuss on line activity. I find most of my clients are overwhelmed with their passwords, listing them on random pieces of paper or one large piece of notebook paper that is far from organized. As people grow tired and frustrated of keeping track of passwords, they tend to use the same one over and over so they do not need to remember multiple passwords. As a web designer, I have not only my personal passwords to keep track of, but also my clients. I have found an easy, straightforward solution to keeping track of them all. I store all my passwords in a protected Excel spreadsheet – that way I only need to remember one password. While this method isn’t foolproof – if someone really wants to hack your file they probably can, but it is certainly more secure and organized than the scratch sheet of paper on your desk. And it is free. I also like that since I back up my files through a cloud program, I can access the file from any computer. Creating the Spreadsheet: I suggest creating a blank spreadsheet first, saving it and testing the password before entering a lot of data. First go to File/Save As and select Tools next to the Save button. Select General Options and the General Options screen will pop-up. Type in a password to open and to modify. I suggest using the same password. Test the spreadsheet by closing it then reopening. You should now be prompted for your password two times. Once the password is set up and tested, I recommend creating workbooks within the spreadsheet for different password categories – shopping, money, e-mail etc. This will help keep the worksheet organized – it can become unwieldy if your passwords are randomly entered. To create workbooks, click on the tabs at the bottom of the spreadsheet, right click and select Rename. Type in a name that refers to the grouping. To add workbooks, right click and select Insert. I hope this tip helps keep your passwords and your workspace more organized. Here are some password tips and a password generator tool from Norton.